If a key ring is too heavy or too large, the weight acting on the key could cause it to turn in the ignition lock or catch on the steering wheel. This could cause the engine to be switched off suddenly. You could lose control of the vehicle and cause an accident. Do not attach any heavy or large key rings to the key that is inserted in the ignition. If you cannot lock or unlock the vehicle with the SmartKey, either the battery in the SmartKey is discharged, the SmartKey is faulty or the starter battery is discharged. - Check the battery in the SmartKey and replace it if necessary. - Unlock the driver's door using the mechanical key. - Lock the vehicle using the mechanical key. - Have the starter battery and the battery contacts checked at a qualified specialist workshop. If the SmartKey is faulty, contact Roadside Assistance or a qualified specialist workshop. When it is dark, the surround lighting also comes on if it is activated in the on-board computer. You can also set an audible signal to confirm that the vehicle has been locked. The audible signal can be activated and deactivated using the on-board computer. If you do not open the vehicle within approximately 40 seconds of unlocking: - the vehicle is locked again. - the theft deterrent locking system is armed again. - The KEYLESS-GO key can be used like a conventional key. - You can combine KEYLESS-GO functions with those of a conventional key, e.g. unlock with KEYLESS-GO and lock with the button. - Always carry your KEYLESS-GO key on your person. - metallic objects, e.g. coins or metal foil. This can affect the functionality of KEYLESS-GO. - When locking and unlocking using KEYLESS-GO, the distance between the SmartKey and the corresponding door handle must not exceed 3 ft (1 m). - If the KEYLESS-GO key is removed from the vehicle, it is possible that the system may not recognize the SmartKey. The vehicle can then not be locked or started using KEYLESS-GO. - To unlock the vehicle: touch the inner surface of the door handle. - To lock the vehicle: touch sensor surface 1. - Convenience closing feature: touch recessed sensor surface 2 for an extended period. simultaneously for approximately six seconds until the battery check lamp flashes twice. - To unlock the driver's door: press the button once. - To unlock the driver's door: touch the inner surface of the door handle on the driver's door. - To unlock centrally: touch the inner surface of the door handle on the frontpassenger door or the rear door. - To lock centrally: touch the outer sensor surface on one of the door handles. - To deactivate the alarm with KEYLESS-GO: press the Start/Stop button in the ignition lock. The SmartKey must be in the vehicle. - Lock or unlock the vehicle using KEYLESS-GO. 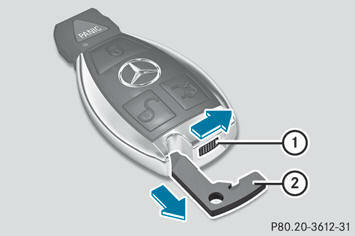 - Push release catch 1 in the direction of the arrow and at the same time, remove mechanical key 2 from the SmartKey. Have the batteries changed at a qualified specialist workshop. Swallowing batteries can lead to serious health issues or death. Seek medical attention immediately if a battery is swallowed. The SmartKey batteries contain perchlorate material, which may require special handling and regard for the environment. Observe government disposal guidelines. California residents, see www.dtsc.ca.gov/HazardousWaste/Perchlorate/index.cfm. The battery is working properly if battery check lamp 1 lights up briefly If battery check lamp 1 does not light up briefly during the test, the battery is discharged. 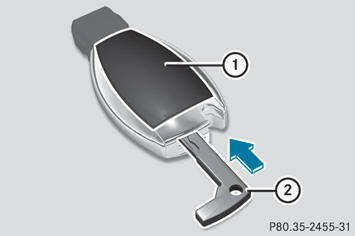 - Press mechanical key 2 into the opening in the SmartKey in the direction of the arrow until battery tray cover 1 opens. When doing so, do not hold cover 1 shut. - Remove battery tray cover 1. - Repeatedly tap the SmartKey against your palm until battery 3 falls out. - Insert the new battery with the positive terminal facing upwards. Use a lint-free cloth to do so. - Make sure that the surface of the battery is free from lint, grease and all other forms of contamination. - Insert the front tabs of battery tray cover 1 and then press to close it. - Check the function of all SmartKey buttons on the vehicle. You cannot lock or unlock the vehicle using the SmartKey. The SmartKey battery is discharged or nearly discharged. If this does not work: - Check the SmartKey battery and replace it if necessary. - Lock or unlock the vehicle using the mechanical key. - Have the SmartKey checked at a qualified specialist workshop. You can no longer lock or unlock the vehicle using KEYLESS-GO. There is interference from a powerful source of radio waves. There is a malfunction with KEYLESS-GO. - Have KEYLESS-GO checked at a qualified specialist workshop. You have lost a SmartKey. - Have the SmartKey deactivated at a qualified specialist workshop. - Report the loss immediately to the vehicle insurers. - If necessary, have the locks changed as well. You have lost the mechanical key. - Report the loss immediately to the vehicle insurers. The engine cannot be started using the SmartKey. The on-board voltage is too low. - Switch off non-essential consumers, e.g. seat heating or interior lighting, and try to start the engine again. If this does not work: - Check the starter battery and charge it if necessary. The engine cannot be started using KEYLESS-GO. The SmartKey is in the vehicle. A door is open. Therefore, the SmartKey cannot be detected as easily. - Close the door and try to start the vehicle again. There is interference from a powerful source of radio waves. - Start your vehicle with the SmartKey in the ignition lock.